To keep you inspired and ease the stress in the kitchen this Christmas we have put together a blog of some of our favourite Christmas recipes. If fruit Christmas trees, Marmalade ginger glazed ham, fancy chocolate dipped strawberries, feta and basil skewers, or mulled pears & blue cheese salad sound like scroll on down. The recipes are festive, delicious and healthy so should keep the whole family happy! Cut melon in 1.5-2cm thick slices. Discard skin and seeds. 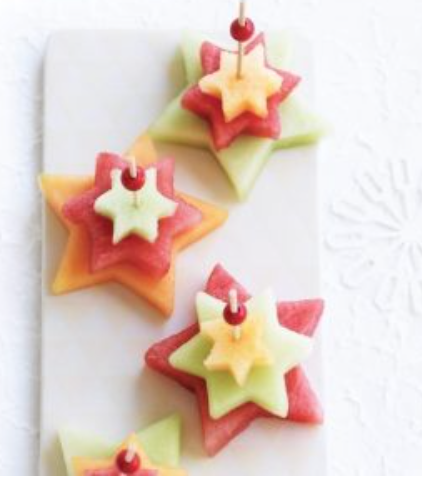 Cut star shapes from fruit with cutters. Thread three graded stars from the different fruits onto each skewers, going from the largest to the smallest. Stand the stars on a serving plate. Secure with toothpick. TIP: If a whole leg is too much, use a half leg of ham, or a small shoulder of ham. Simply halve the glaze ingredients, but cook in the same way. Line a tray or plate with baking paper. Pour each topping onto own small plates or bowls. If toppings are in large pieces, like nuts, pour into the blender and blitz until chunky meal has formed. Break chocolate into chunks into a bowl. Melt until smooth using bain-marie method or microwave. Dip each strawberry about 3/4 of the way in the dark chocolate, and then hold strawberry above the bowl of melted chocolate to let any excess drip off. Dunk each strawberry into the toppings, until each side is evenly coated. Place onto the baking tray. Once you have a tray full, place tray in the fridge for strawberries to harden. Cut watermelon into small cubes (around 3cmx3cm). Squeeze a little lemon juice over each cube. Cut feta into small cubes, around 2cmx2cm. Peirce each piece of cubed watermelon with a cube of feta and a single basil leaf using a toothpick. Place pears into pot, adding extra water to cover. Bring to a simmer, cover pears with a circle of baking paper to cover, and cook for 40 minutes or until tender. Remove pears from liquid. Increase heat to medium, reduce for 20 minutes or until reduced to quarter and looks a little syrupy. We hope you enjoy these Christmas recipes! Happy Christmas from the Feel Fresh Team!